If you are searching for a birthday card that stands out from the rest, you have just found it! This fantastic greeting card showcases purple, blue, and green fireworks bursting in the air in honor of someone’s birthday today! It’s a fabulous scene that makes this birthday card worth sending. 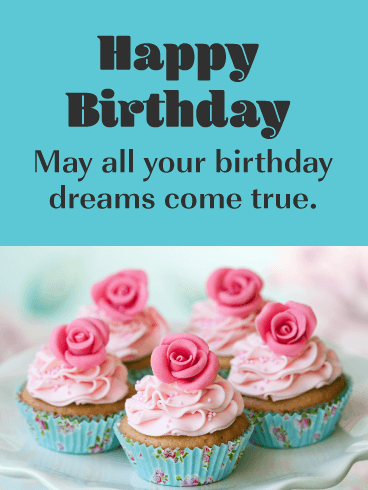 It will wish them a fantastic day and let them know that their birthday is important to you! Happy Birthday to you! A birthday is the most special day of the year for many because it represents the day someone was born. What could be more important than that! 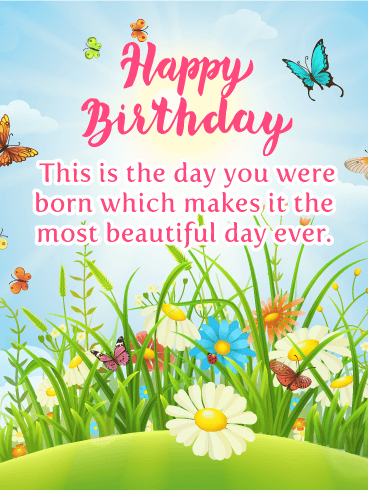 This is what makes this birthday card so perfect, it will remind them that this day is all about them, and it wishes them a big happy birthday. It will undoubtedly bring a smile to the face of anyone it’s sent to. Every birthday should be honored with lots of cheer, balloons, presents, and more! But most of all, they should receive a special greeting card that honors their big day, especially one as colorful and exciting as this! 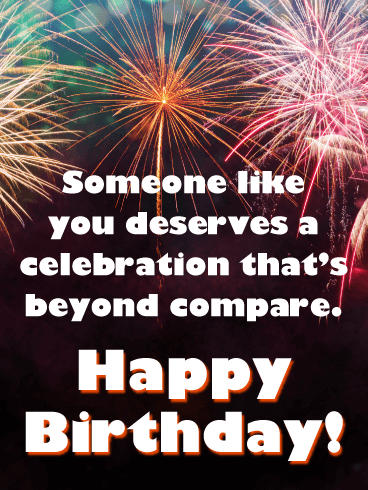 So if you know someone who is celebrating a birthday today, put a smile on their face by getting this outstanding birthday card out to them today! These cupcakes are beyond perfect! They are simply the best cupcakes ever and can be enjoyed by those who love excellent desserts. These cupcakes showcase perfect frosting, sprinkles, and fancy pink cupcake holders. They look fabulous! Birthdays are meant to make people feel special and this card will do just that. Get these delicious cupcakes over to someone today by sending this birthday card on its way! 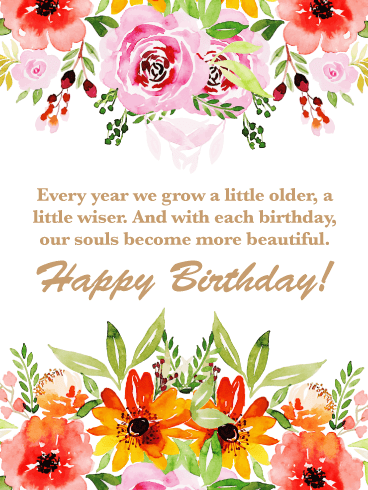 Bring a smile to their faces with this beautiful floral birthday card! There are few things that can compete with a garden in full bloom on beauty, but the glowing smile of someone on their birthday puts all of Mother Nature to shame. 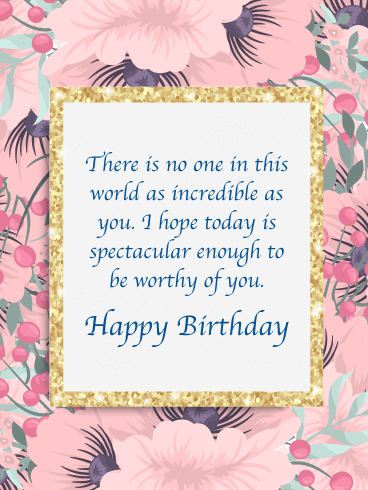 Send this birthday card and make someone special ridiculously happy today. Their smile will light the world. When it comes to wishing someone a happy birthday, this card is beyond compare, just like them! Bright bursts of fireworks against the dark night’s sky fill the top, and below is a thoughtful message to your friend, family member or co-worker, letting them know you hope they have the kind of celebration they deserve. If anything says a birthday is happening, it’s a big colorful cake with lit candles! 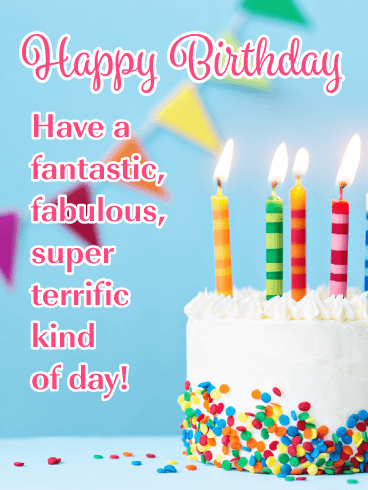 This great birthday card has everything you need to say happy birthday in style – a cake with perfect frosting and confetti, decorative candles, birthday streamers, and bright pink lettering! 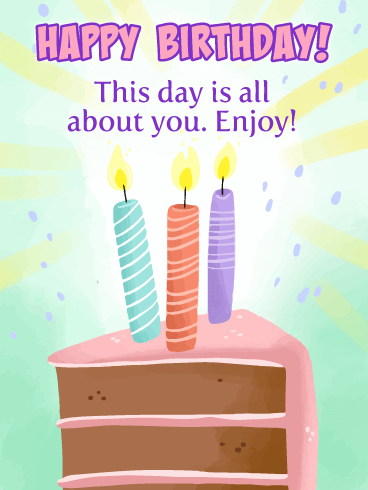 Send this birthday card out soon while the candles are still glowing! Send someone a Happy Birthday message that’s surrounded by fireworks bursting in the air! They will feel the excitement the moment they see it! 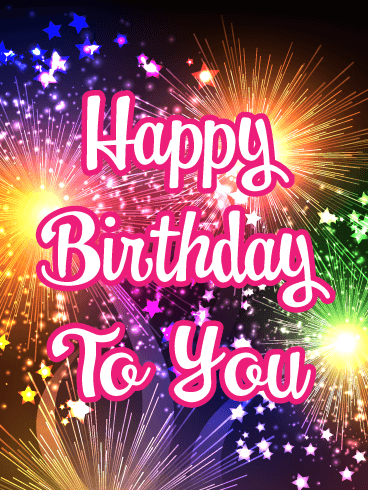 This terrific birthday card has all the colors of the rainbow set against the night’s sky, it’s a spectacular sight to see and will brighten the day of anyone celebrating their birthday! Be sure to send these fireworks off to someone you know before the shows over! This birthday card has it all – a pink sparkling background, a perfectly frosted birthday cake with candles and roses, and fancy happy birthday lettering! You really can’t go wrong by sending this card out to someone special on their birthday. It’s guaranteed that they are going to love it. The best part is that the candles are lit and ready for their wishes. Send a birthday card that’s bursting with color and excitement! Festive balloons, rays of light, and some sparkle fill the page of this outstanding birthday card. It will certainly remind someone of how special their big day really is! If you're going to send a birthday card, you should send the best, and this one is definitely a must-send!! This delightful birthday card displays lovely delicate pink flowers that will make someone very happy. This birthday card has a simple look that lets the viewer focus on the flowers. They look so wonderful, you can almost smell the roses. If you know someone who would really appreciate flowers for their birthday, then don’t wait, send them over while they are in full bloom! If you know a dog lover who is celebrating their birthday, then this super cute puppy would love to meet them! This lovely birthday card features the most adorable puppy resting near beautiful pink flowers. So sweet! 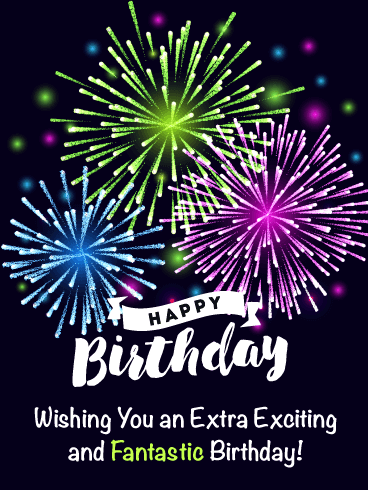 The message wishes them a happy birthday and a wonderful day. This will be sure to make their birthday extra special! Send this little guy over to someone special today! Send some sparkling excitement, along with a perfect cupcake over to someone to let them know you are thinking of them on their birthday! 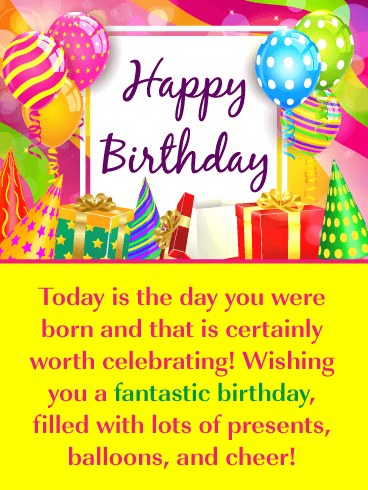 This greeting card is to the point, they will see the large birthday wishes right away, there’s no missing it! So if you want to simply wish someone a happy birthday in style, this is the greeting card for you! This exquisite birthday card displays a lovely basket of beautiful flowers, a precious kitten, and a magnificent butterfly. 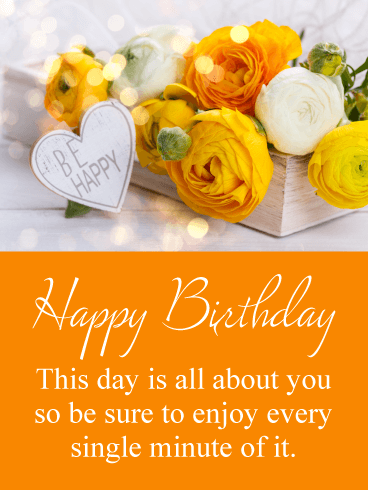 They all come together to create a gorgeous birthday card that can be enjoyed by anyone who is celebrating their special day. 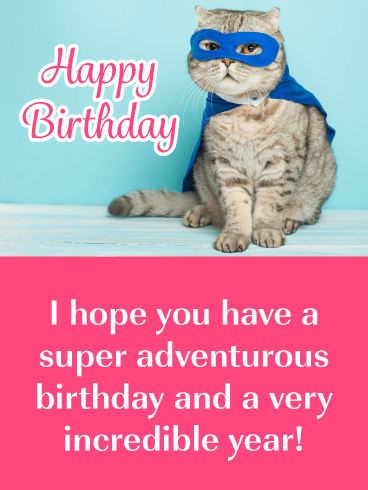 So be sure to send this kitten on its way to wish someone a happy birthday without delay, because it will certainly brighten their day! Share your love with this birthday bouquet! 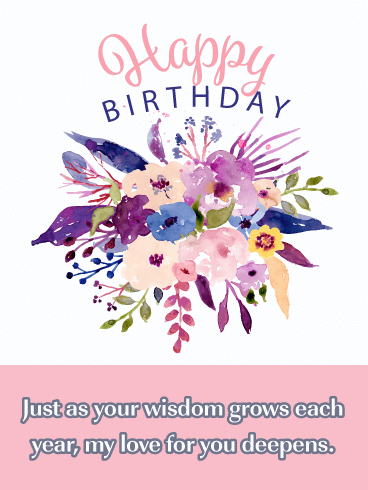 This birthday card is bursting with flowers, bight and eager to wish your loved one a happy birthday! Let their heavenly scent fill the day with joy and calm, making sure the birthday boy or girl has a fabulous day. Give them a display of flowers that will never die and send all your love for their birthday this year. 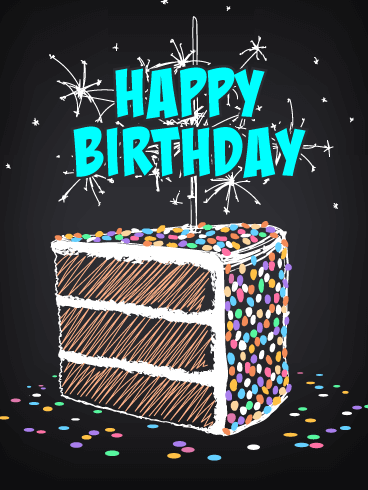 Kick start the festivities with this party-ready birthday card! It’s got balloons. Confetti and blowers. Wrapped gifts. And of course, candles to stick on the birthday cake! Everything needed for a proper birthday celebration is right here. 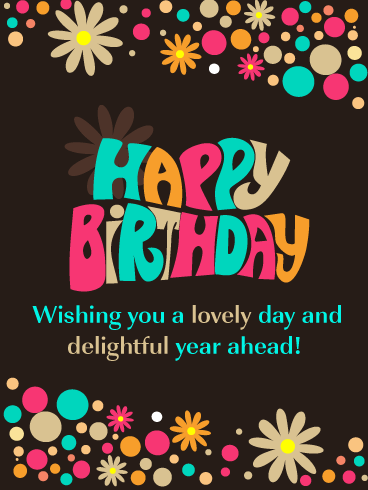 So send this card and make sure someone has an exciting birthday! They’re sure to remember this card and the awesome person who sent it. This exceptional birthday card would be fitting to send to anyone who loves beautiful flowers. The shimmering lights give it a special touch and the wonderful shades of yellow and orange present a bright and happy feel. Send this joyous card on its way to fill someone’s heart with happiness on this big day. 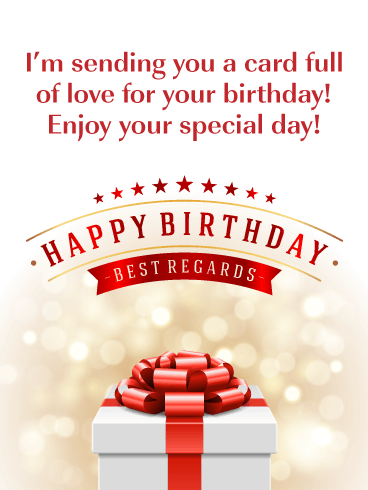 Send a birthday card full of love this year! It’s not cake and ice cream that make a birthday special, it’s the celebration of an amazing person. Today’s the day to shower them will love, to have as much fun as possible, and to let your loved one know they will always have you to count on. Let them know you love them with this bright birthday card. This vibrantly colored birthday card will catch the attention of anyone celebrating their big day. 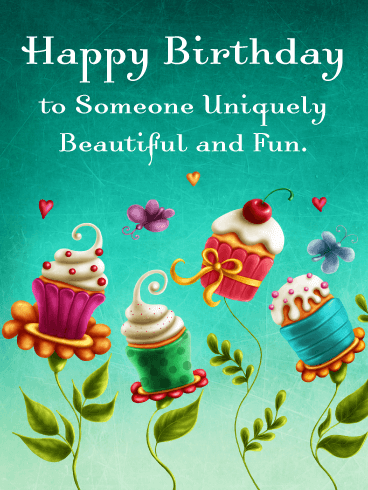 It’s a fun and happy card that captures the essence of a birthday and how joyful it should be. 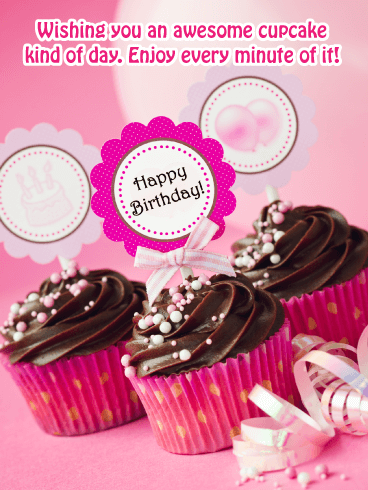 It features a fabulous cupcake, pink and yellow birthday balloons, and a special message. So if you know someone who is having a birthday today, send this awesome card on its way, it will get their day started off the right way! Do you know someone who is celebrating their birthday who enjoys the artistic side of things? If so, then this is the greeting card to send in honor of their big day. It showcases a cake that looks hand-drawn with lots of sprinkles and a few sparkles. They will love the fact that you selected such a unique card, it will make them feel special. Send it off today so they can enjoy this creative birthday cake right away. 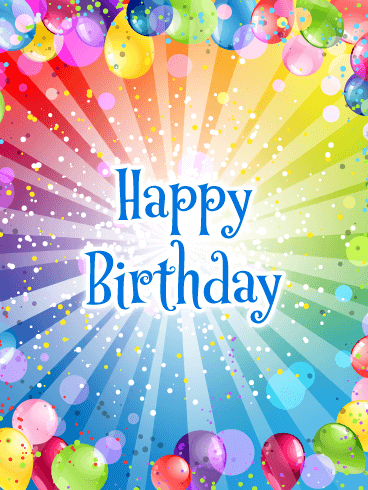 Wish your friend, coworker, or family member a happy birthday with this colorful and creative greeting card! It features artistic lettering and vibrant colors that look great against the black background. A birthday is worth celebrating and making someone feel special, and that’s what greeting cards are for! These puppies are really working it! They are posing and trying to look cute for someone’s special day, and they look especially adorable next to the pretty purple flowers. 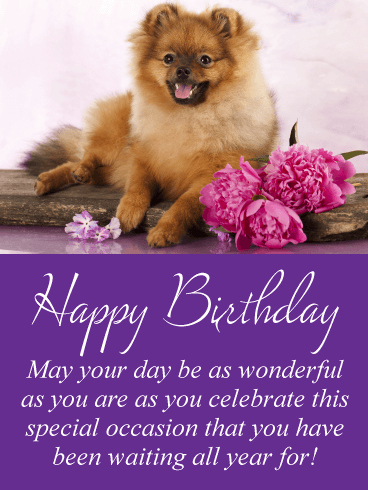 No matter who is celebrating their birthday today, they will undoubtedly love this wonderful puppy card. Send these little guys soon, they can’t wait to meet the person who receives this card! 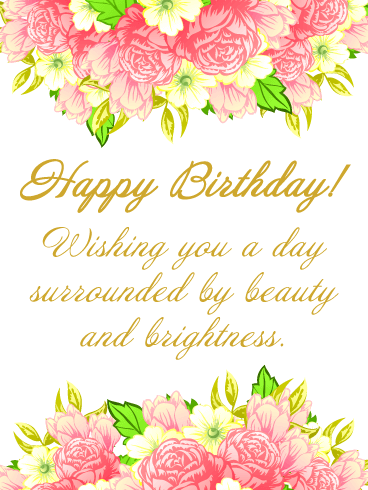 A flourish of pink and yellow flowers decorates this lovely card for someone special on their birthday. It’s a heartfelt way to wish them well while letting them know you’re thinking of them and that you want them to have a day surrounded by beauty and brightness. Whatever age they’re turning this year, they’ll be touched to receive such a beautiful greeting. 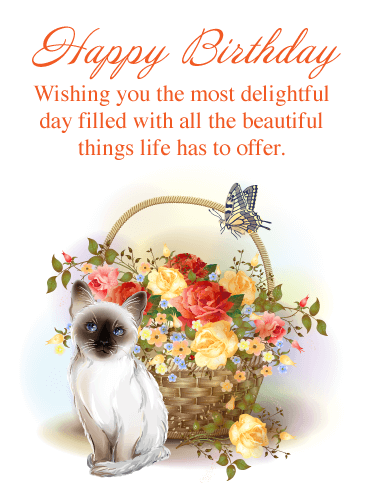 If you know someone who loves the pretty things in life, then they will really enjoy this birthday card. It’s filled with lovely butterflies, pretty flowers, and a cheerful message! It will allow you to send a smile over to someone you care about today by sending this greeting card to them without delay. They will certainly appreciate that you are thinking of them! These spectacular cupcakes feature a perfect rose topping, decorative frosting, and lovely cupcake holders. They look fabulous! Anyone celebrating their big day will appreciate that you took the time to send such a delightful birthday card. So make sure to let someone know that you wish all their dreams come true with this sensational birthday card today. 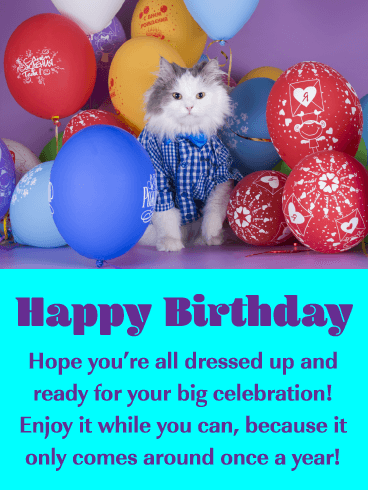 Break out the balloons and the celebration kitty because it’s time to celebrate a birthday! 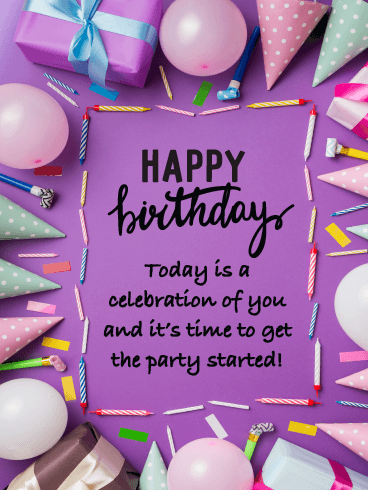 Send this awesome birthday card over to let someone know that this day only comes but once a year, so it’s time to get the celebration started now! This birthday cat is waiting to meet your friend, coworker, or family member who is having a birthday today, so don’t make this patient kitty wait a minute longer. Make them feel loved and appreciated for their birthday! Part of the beauty of flowers is watching them grow. From seed to seedling to a collection of leaves and finally a gorgeous bloom. Watching loved ones grow is just as wondrous, as they grow stronger and their petals, their personality, and souls, become more vibrant. Celebrate how far they’ve come by sending this garden birthday card! 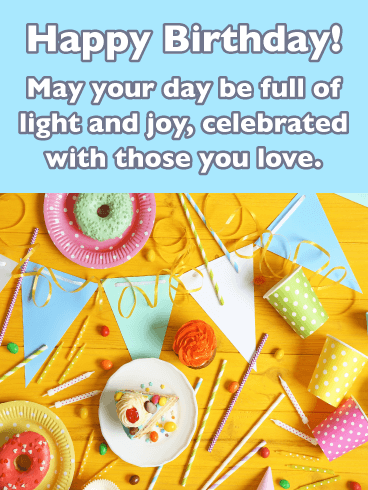 Let someone know how much they mean to you with this festive birthday card! There are people in our lives who shine. Bright, shimmering souls full of kindness that we wish all the best for. Let them know how amazing they are with this birthday card. Full of wishes and love, it’s the perfect gift for your special someone. 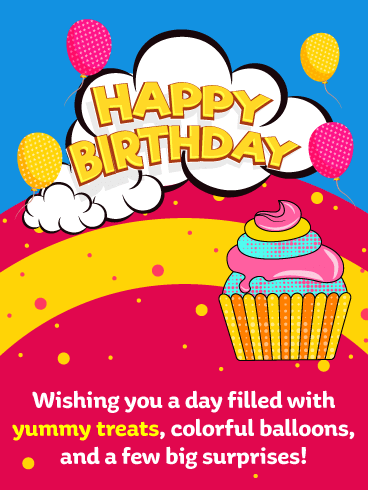 Make their birthday a happy one and send this card. 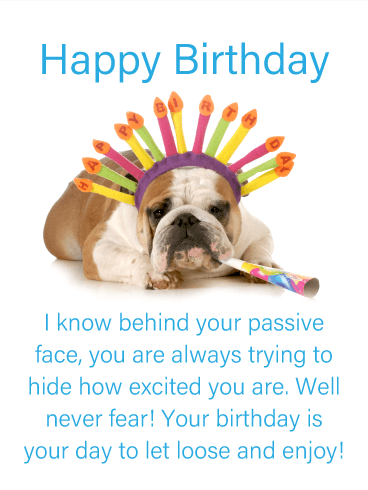 This cute and funny birthday card will bring a smile to anyone’s face! This kitty is ready for anything. He is wearing a cape and mask, and looks like a superhero! So wish someone a super adventurous day and an incredible year. They will surely think you are the best for sending this great card their way. Turn their birthday into a one-of-a-kind celebration with this gilded birthday card! Wish them a day full of splendor and happy memories, not just for today but the entire year! After all, they’re an amazing person and deserve 365 incredible days. 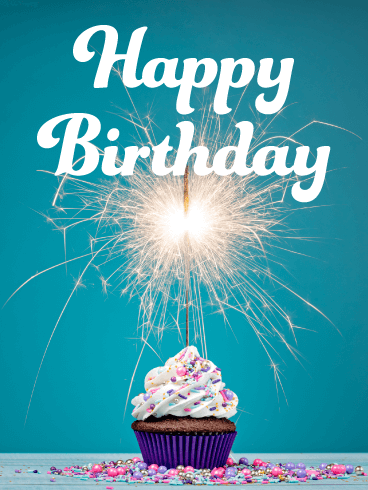 Do more than saying “Happy Birthday” this year. Make sure their celebration is sensational by sending this card! 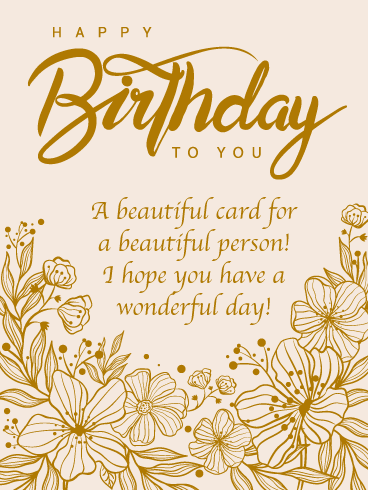 If you know someone who loves the artistic and creative side of life, then you should definitely send this birthday card their way! It showcases the most wonderful cupcakes that have a unique look. They are beautiful and make this greeting card extra special. So surprise someone today with these fun cupcakes on their big day. 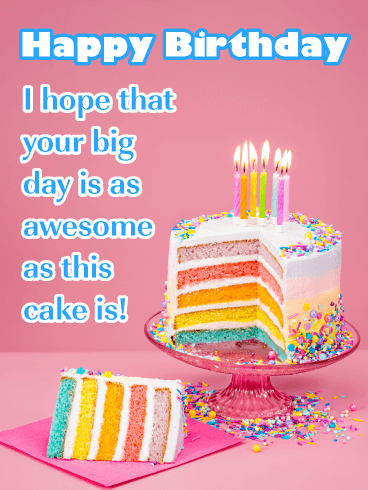 Colorful layers of delicious cake, white frosting, perfect sprinkles, and shimmering candles, all set the stage for an outstanding birthday card. This card will get someone’s day off to a great start and add joy to their heart. 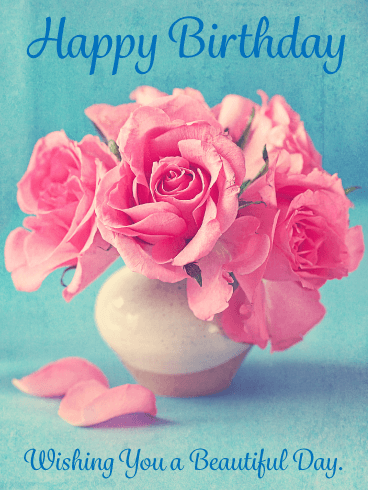 Let this special card wish someone an awesome day and remind them of how much you care! Fill their birthday with immense joy! This card is packaged with love, stuffed in a box and wrapped with a large, red bow. It’s guaranteed to make the birthday boy or girl feel happy and incredible, knowing that someone loves and cares for them so much. 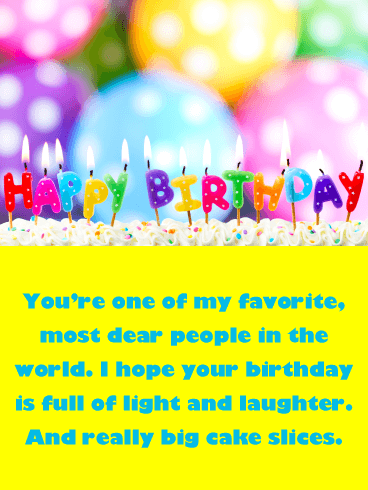 Send this birthday card today and make their birthday extra special. 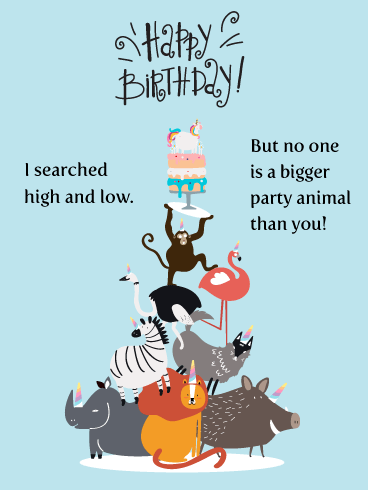 Make their birthday wild with this adventurous card! It takes a party animal to know one, and there’s no better time than a birthday to go all out. Eat all the cake, take a giant spoonful of ice cream. Crank up the music, hit the dance floor, and go crazy! Birthdays are meant to be celebrated; a party is the best way to go. Send this birthday card and make sure this year, the party is incredible. 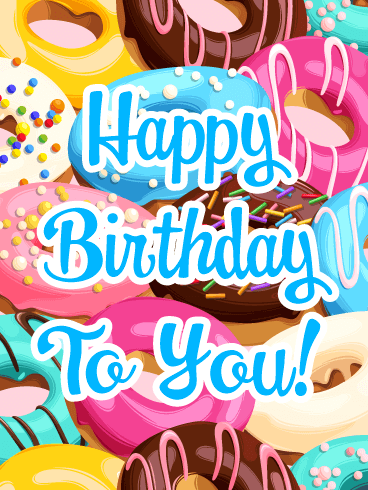 Everyone loves donuts, and that’s why you should send this card out to anyone who is celebrating their birthday! This greeting card is super colorful and fun, and will be sure to brighten their day. Get this happy birthday card out to someone today so they can enjoy these donuts before they are gone! If you are looking for a spectacular birthday card, look no further! 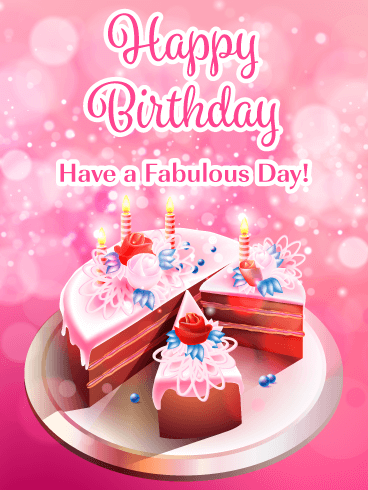 This delightful greeting card displays a wonderful piece of cake with yummy pink frosting, lit candles, and an exciting background that’s bursting with light! Make someone feel very important today with this impressive birthday card. They will certainly appreciate it! 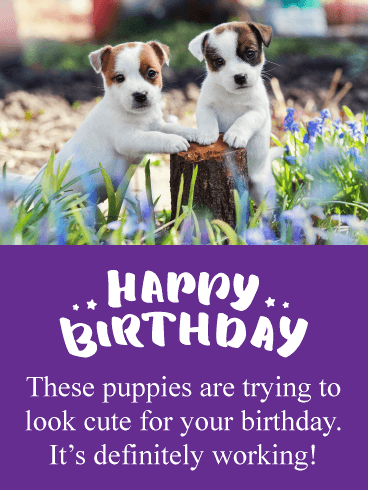 If you know someone who is celebrating a birthday and they love dogs, then this birthday card is for them! It features an adorable dog wearing a birthday hat and he is surrounded by colorful balloons. It doesn't get any better than this! Celebration confetti was added for extra excitement and to give this birthday card a festive look! 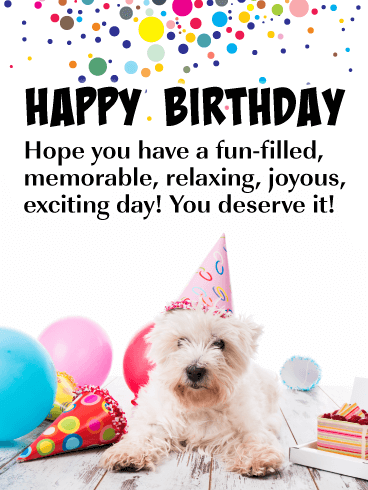 Send this birthday dog over to the person you know that is having a birthday today so they can get the party started soon! We all know an Eeyore, a person who remains unphased by anything that happens, who chugs through the horrible and manages to give away nothing in the process. But birthdays are not the occasion for straight faces! Do your best to make them smile, inspire a twinkle in their eye. Today is a bright, happy day! 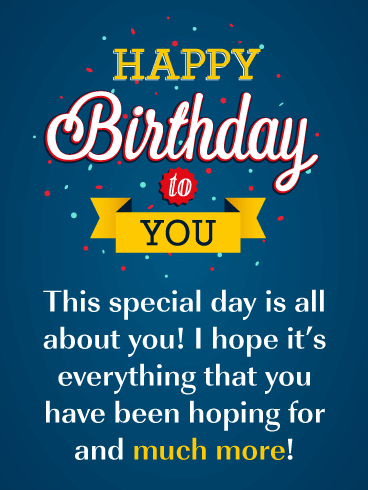 Tell them "happy birthday" and help them live it to the fullest with this birthday card. A life well-lived holds many layers, like a birthday cake! Only they are layers of learning experiences, fond memories, and accomplishments. 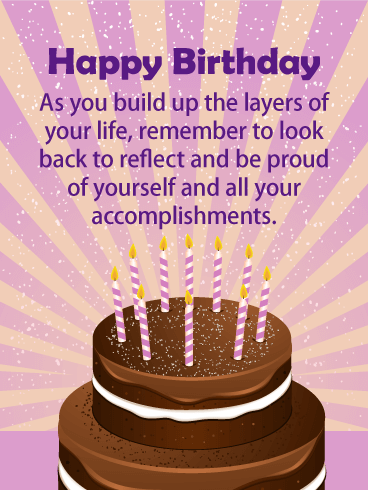 Send this delicious chocolate layer cake happy birthday card to a true go-getter to let them know you see all their hard work coming to fruition and are proud of them! Keep moving forward, but also remember to celebrate how far you've come! Tension mounts. The grip is tight. The cork pops on their special night! Send this Champagne Birthday wish card to the people who make your life sparkle. If there is one day to help a loved one rise to the top like a bottle of bubbly, it's their birthday. 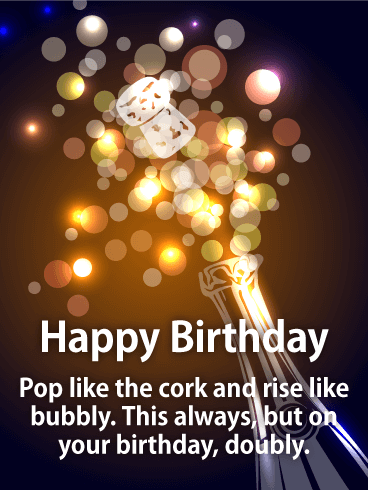 With this birthday card, you can be the champagne that rockets their birthday across the sky!